Not only postage due stamps can be used to pay a postage due fee. Regular and commemorative U.S. postage stamps are also ocassionally found paying the missing postage and are nice items in and of themselves for the thematic collector When combined with other factors, they become even more interesting. 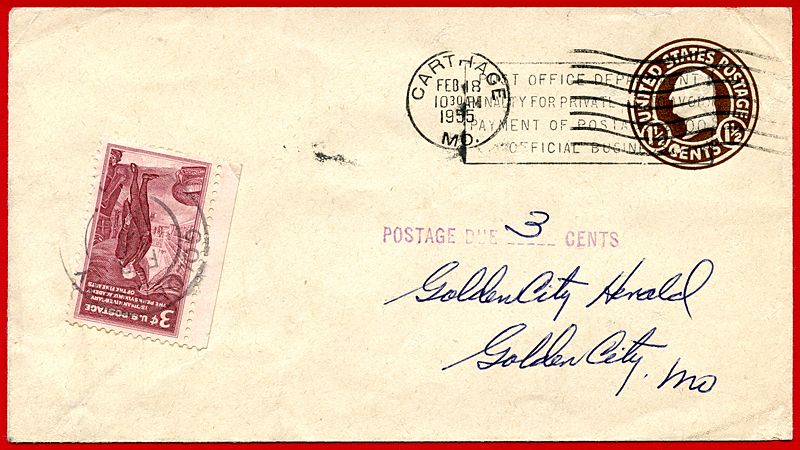 This cover from Carthage to Golden City, Missouri is dated 18 February, 1955. 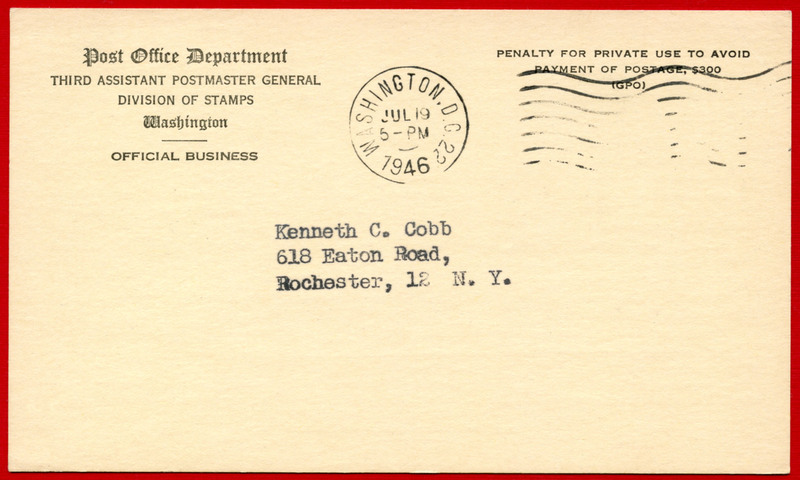 The envelope has a 1.5 cent imprinted indicia (postal stationery) with an overprinted penalty clause for official business. This was done by the Post Office Department and the envelopes could only be used by them. Legally, the person using this cover to avoid postage could be fined $200.00. Fortunately for the sender (no sender’s address is on the rear), the fine was ignored and a 3¢ postage due fee assessed instead using a single copy of the 150th Anniversary of the Pennsylvania Academy of Fine Arts (Philadelphia) commemorative issue depicting Charles Wilson Peale (1741-1827 – painter and naturalist) and a mammoth leg bone in the lower right corner. 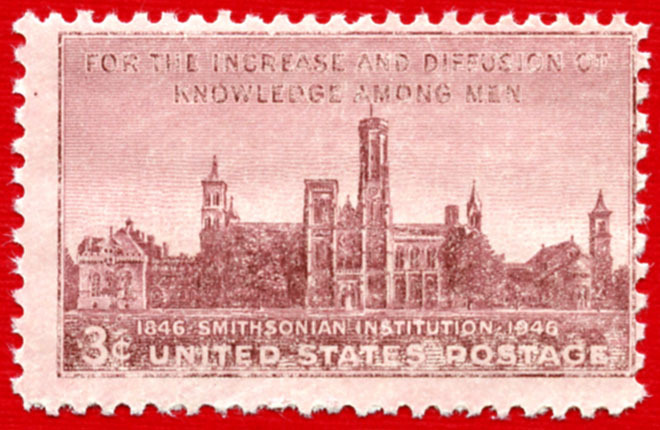 The Smithsonian Institution was established in 1846 “for the increase and diffusion of knowledge among men” by James Smithson, a British scientist, through a grant from his estate in 1836. 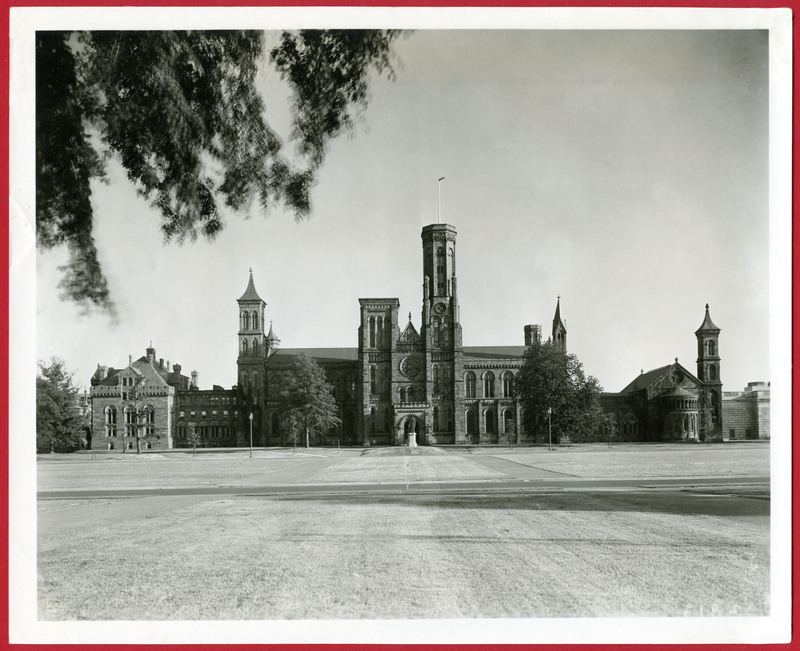 Originally known as the “United States National Museum,” the museum’s name was officially changed to the Smithsonian Institution in 1967 although it had been known by that name almost since the beginning. 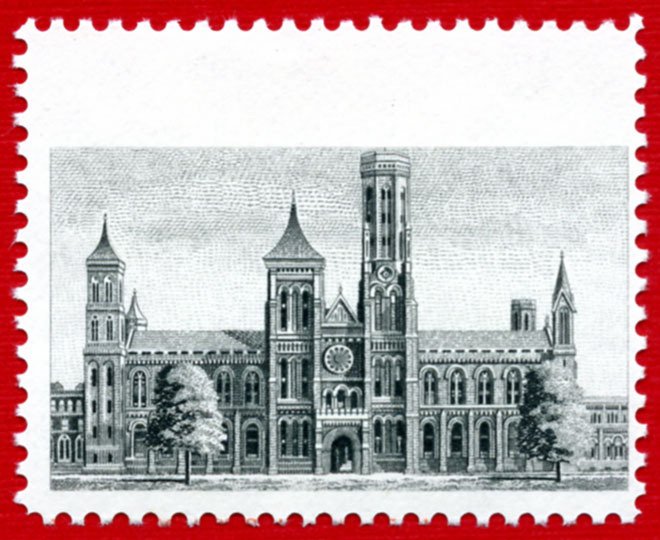 U.S. postage stamps have commemorated the Smithsonian Institution on three occasions. Each of the stamp designs depicts the main building, known as ‘The Castle’, from the same perspective but the production methods differ. 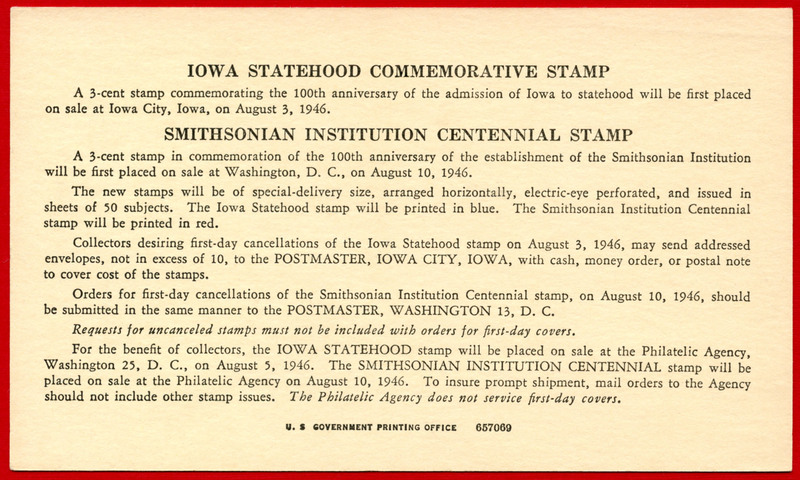 The August 10, 1946 issue (domestic first class letter rate of 3 cents) commemorated the 100th anniversary of the museum and the stamp design is from an official photograph taken by F.B. Kestner, Smithsonian photographer. Announcement cards were sent to news sources, publications and collectors advising of the date of issue and background information for the issue. 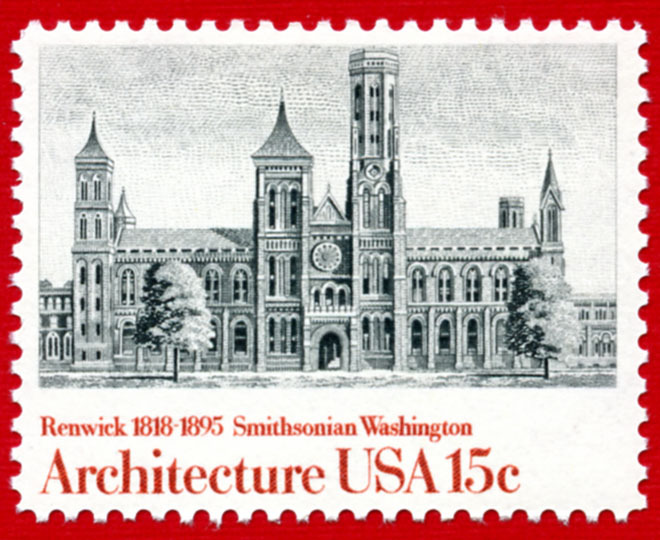 The second commemorative issue (domestic first class letter rate of 15 cents) was part of a set issued to honor U.S. architectural achievements and included three other institutions. This depiction is a wonderful line drawing design that, in my opinion, is the most attractive of the designs. 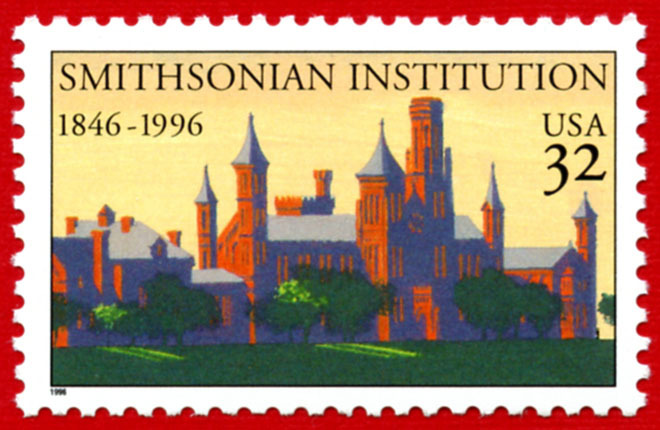 The commemorative issue of 1996 (domestic first class letter rate of 32 cents) honored the 150th anniversary of the institution. Although an interesting representation, the lack of detail somehow detracts from the aesthetic of what I envision as an institution documenting history. In the following instance, the perforation machine was out of alignment and text for the design now appears at the top of the stamp rather than the bottom. It wouldn’t be too noticeable other than the text was slightly clipped at the top. 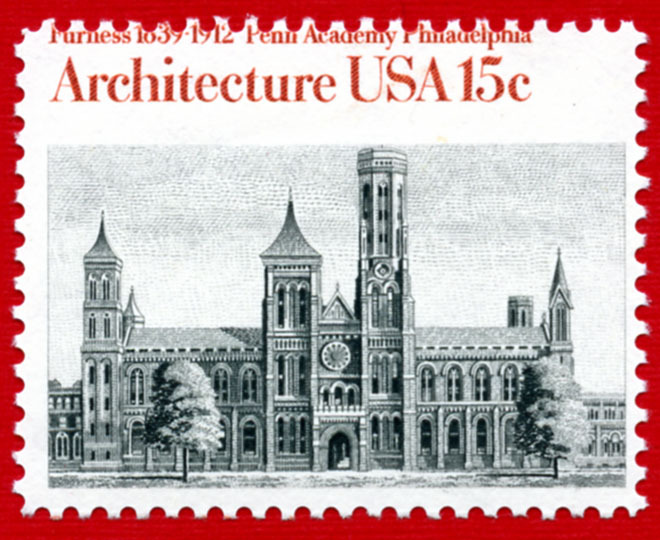 Additionally and more importantly, this issue happened to be a se-tenant, with the stamp for the Penn Academy, Philadelphia stamp above it. 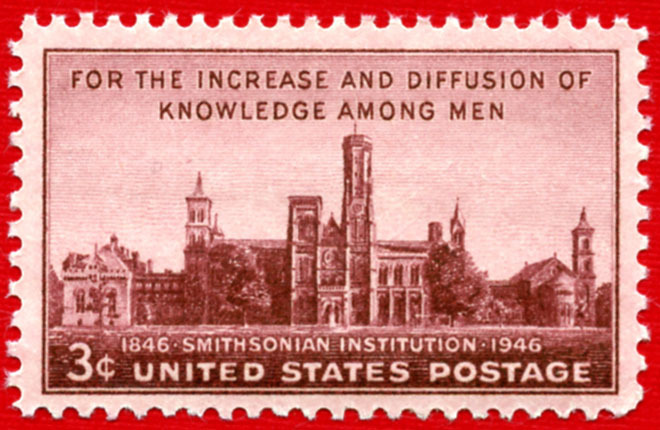 By shifting the perforation upwards, the Penn Academy text now appears on the Smithsonian stamp – a wonderful fluke of luck for those of us loving such things. A variety of such a mis-perforation results in missing text, making it appear the red color has been omitted during the press run. The actual case is that the margin above this position on the sheet was blank. Errors such as these are often overlooked by the stamp’s purchaser and can be used for mailing as this example demonstrates. It went through the mail un-noticed and eventually landed in the collection. It’s another of my favorite items for all of these reasons. Serendipity strikes on occasion and the two covers below are surely an example. It may have been that someone connected with the SDMNH thought the museum’s return envelopes were an opportunity to make some interesting natural history related covers. I believe these envelopes were intended for membership renewals and perhaps there actually were members in the cities they were mailed from. The covers are posted from two cities with paleontological names and use the trilobite issue of the April 29th 1982 Energy commemorative issue to produce a thematically connected cover. They do that very nicely and one can’t argue that each one alone appears to be commercial mail. I’m a little skeptical however as the mailing dates are very close, but then again, membership renewals are done within a short period. 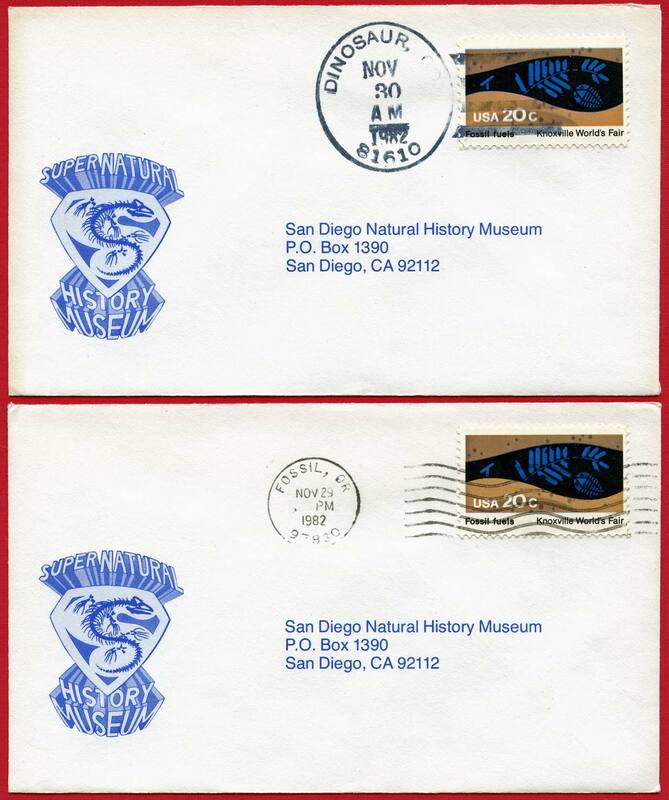 The first cover is posted from Dinosaur, CO (Nov. 30, 1982) at the first class rate of 20 cents, to the museum in San Diego, CA cancelled with a four bar hand device. The second cover is posted from Fossil, OR (Nov. 29, 1982) at the first class rate of 20 cents, to San Diego, CA cancelled by a wavy line machine device. I’ve only seen these two covers, so am not able to say if more were purposely made or not. If they are, one would believe no more than a handful exist, but until more are forthcoming, I can rejoice in these two examples and the thought that serendipity does happen. 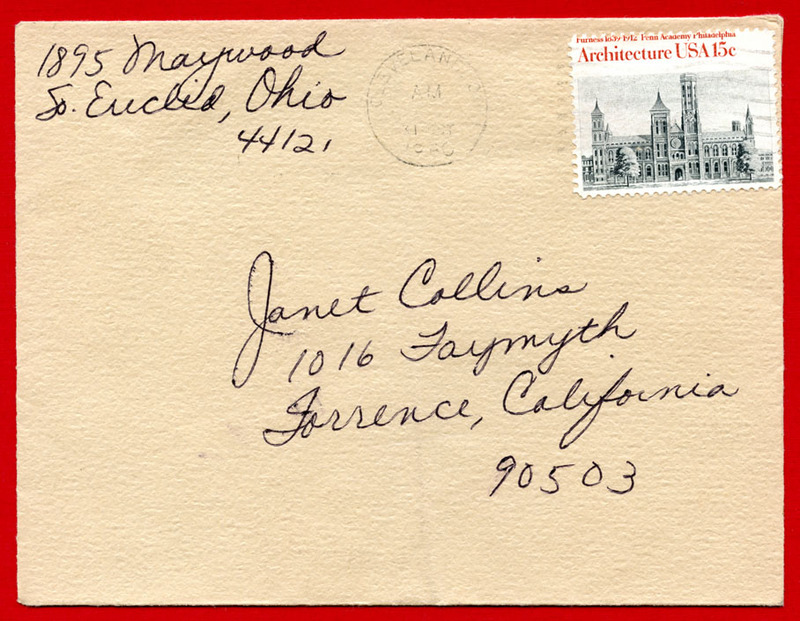 This cover from Los Angeles, CA (Jan 28, 1947) to Bennington, VT (Jan 30/31, 1947) used nine copies of the 1946 U.S. commemorative issue for the 100th Anniversary of the Smithsonian Institution and a supplemental two cent stamp to pay the airmail postage (5¢), plus the registration (20¢) and return receipt (4¢) service fees. The cover was returned undelivered to the sender (Feb 4/8, 1947) as the recipient was deceased.